49ers Leading Rusher NOT NAMED GORE?! That’s right, it’s going to happen… or maybe it just should? 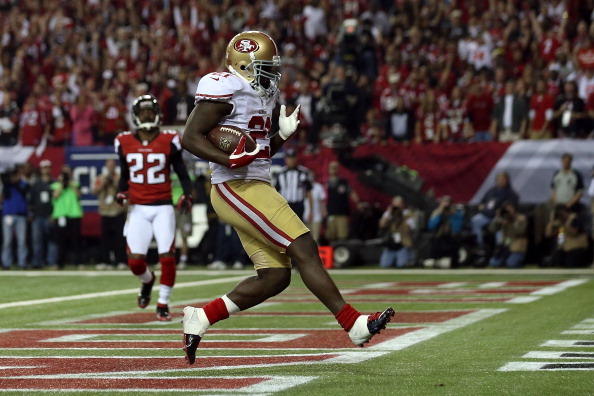 I am a long time Frank Gore supporter but there are issues I have with the 31 year old (when season starts) RB. Let me start off by saying that I am grateful for everything Frank has done for this organization. He deserves a ring and a spot on this roster as long as he’s playing. The man should/better retire a niner! Now let’s get down to it! Kicking off the 2013 season, pundits expected to see a decline in the RB strictly because he was 30 years old. Anyone who has been watching the NFL can tell you that it’s amazing to see 30 year old rushers and rare to see them still in the starting role! Kendall Hunter has been patiently waiting for his chance to show what he’s got; and when he has an opportunity, more times than not, he makes the best of it. Keep in mind that we also have Marcus Lattimore waiting in the wings and chomping at the bit to get on the field. Lattimore would’ve been a top 10 pick had it not been for a significant injury causing him to fall to us in the 4th round. This is a stacked back field without including our athletic FBs that are also ready and willing. This isn’t a Frank bashing article… this is a WHAT IF write up! Be the first to comment on "49ers Leading Rusher NOT NAMED GORE?!"